It was strange. But strange is good. It’s not often you jump on a plane, travel across an ocean, then are picked up in something that feels strangely like home. But that’s just what we found ourselves feeling, as a light brown chunk of metal glided into the Sydney airport pickup on a Friday. Custom built Land Rover Defender with two Feldon Shelter Roof Top Tents. 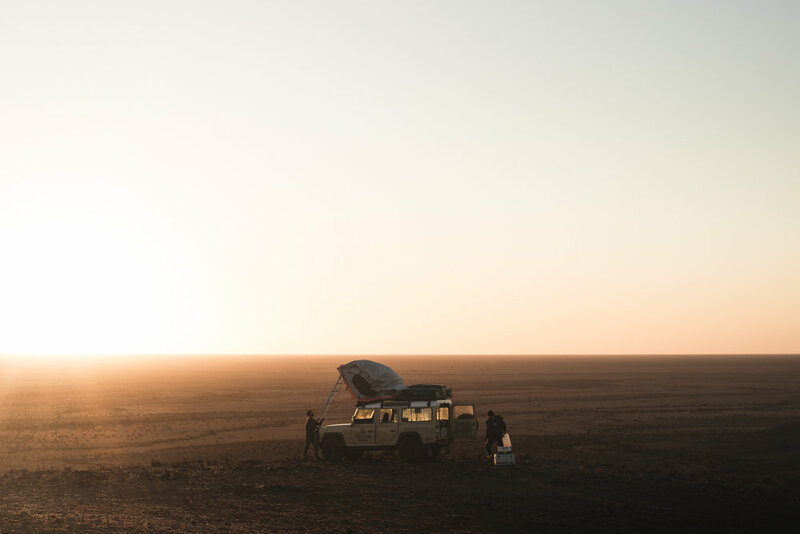 You see, it’s the first time we’d laid eyes on the truck that the team at the Adventure Merchants had built for us, but that doesn’t mean it wasn’t the first time we’d seen the image. Months of calls & messages had been exchanged, deciding between the perfect shade of khaki, what wheels, what bolt ons, what everything. It was clear the Adventure Merchants were going all out, and together we painted the image of our dream rig to take on Australia. Two's not a crowd with this sort of premium roof top living! Well here it was on the first day of the trip, two of our Crow’s Nest tents up top patiently waiting for it’s turn to get lost… and that’s exactly what we did. What better way to break in a new build then pointing directly west & not stopping for 10 or so hours. 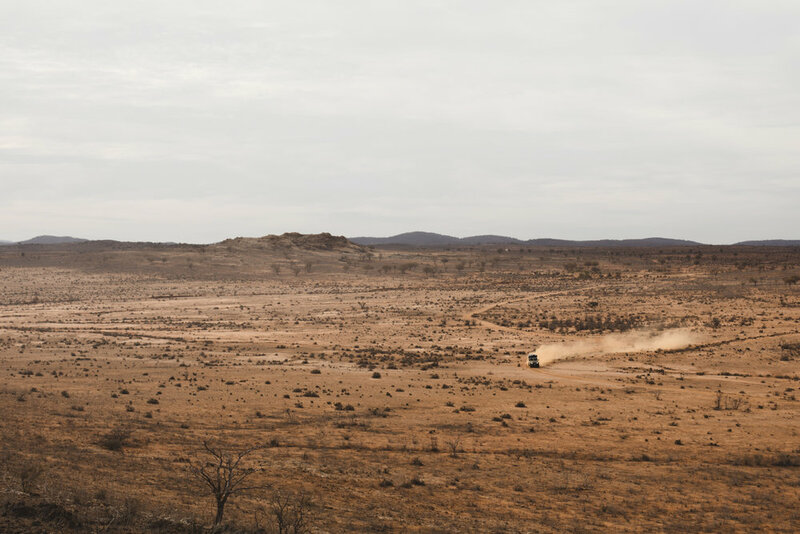 With the familiar sound of Land Rovers 300tdi buzzing in our ears, the truck quickly showed us it was more than up to the task. We’d visited Australia many times, but it was always the lure of the coast that kept us hugging the perimeter of the land, this time we wanted to head straight to the middle. 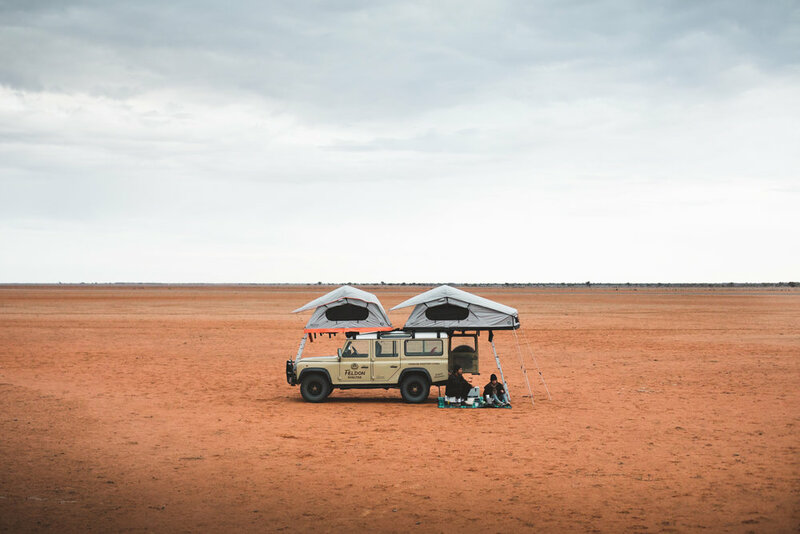 Our tents have been tried & proven by Aussies for years now, but this was the first time they would be available direct, so we wanted to do them proud by getting stuck in to the Australia that many never experience… the outback. There’s two things people always tell you when driving the outback, but the importance doesn’t dwell on you until it’s too late. 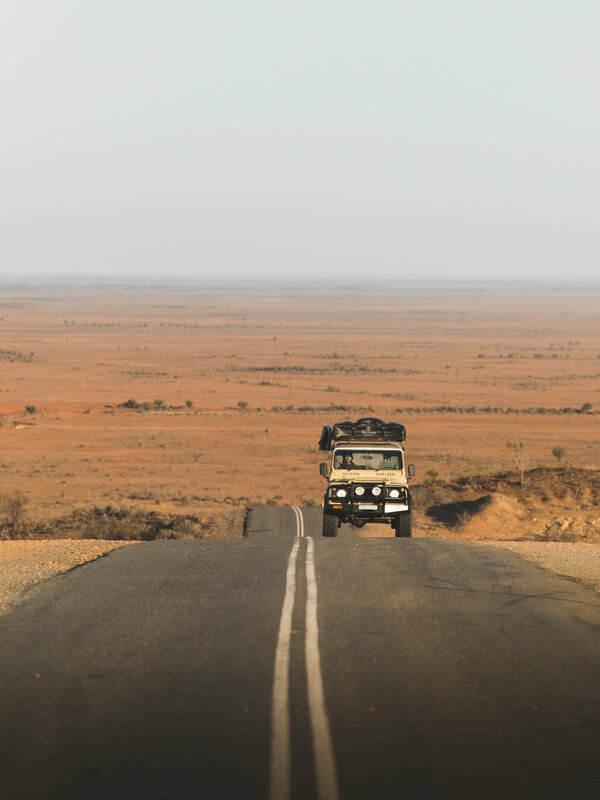 First, the roads are straight, long and unforgiving (so making sure the rig full to the brim with supplies, recovery gear & jerry cans was a life saver). Secondly, don’t drive at night. This one is the most important. Back home, you’d be having a pretty bad night if you struggled to avoid a possum or rouge rabbit. In the outback however, once the sun sets, the roo country. It’s their road until the sun comes up, so there’s not much use trying to share it with them unless a snails pace journey dodging roo’s is preferred to sleep. Now, there’s a few things people don’t tell you. The most important: it gets cold! Yes, even the vast orange expanse get’s cold at night, and we were traveling in the heart of winter. But don’t let winter put you off, infact. We’d encourage it. The days a clear and crisp, the winds are light and without a fly or mosquito to be found, you couldn’t ask for a more picturesque environment to roam around in. We spent the early days of the trip hugging the Darling River as we clocked up the km’s needed to reach the truely orange stuff. Outback rivers aren’t what you’d expect, but you quickly learn to love them. Yabbies (a type of fresh water crayfish) are easily caught and camp spots are plentiful. Waking up next to a bend in the river morning after morning never lost it’s appeal. But finally we had made it to Riverton and felt like we were well & truely reaching our goal. Which was a whole lotta nothing… but as long as that nothing was orange, we were all for it. Nothing but empty, flat, cracked and orange emptiness. Nothing quickly turns into something when your in the heart of the outback. As the sunrises and you’re confronted with the same view in what ever direction you point, the symmetry forces you into it’s pace. We spent days collecting what little firewood was available and with nothing to distract you, keeping a fire going was enough of an activity to keep you going for a day. It’s an environment we had been wanting to get into for so long, but we all had no idea how much we’d enjoy the solitude. 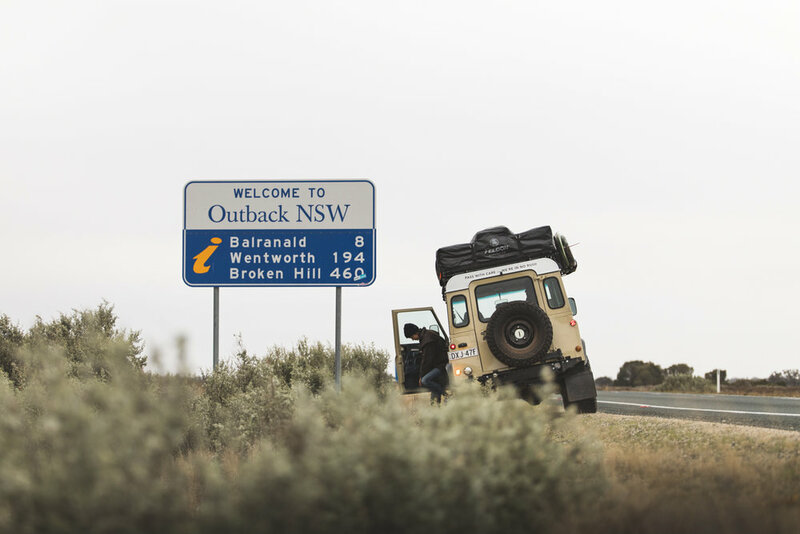 This journey to the orange had been the ideal start to our ‘Offical Australian Adventure’, and along the way plans for more of the same trips were hatched… I mean, it’s a big place. But with our official launch & the perfect rig & tents to take it on, we wouldn’t dream of being anywhere else. Thanks for the warm welcome Australia, now let’s get out there!